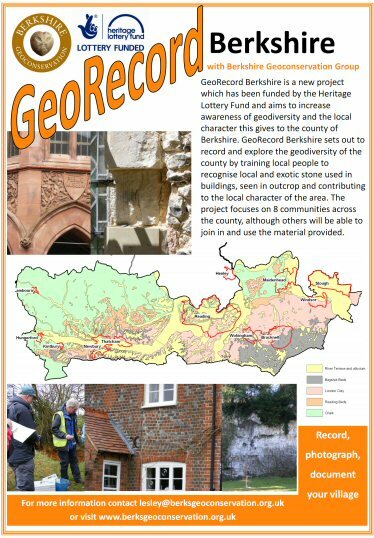 GeoRecord Berkshire is a project funded by the Heritage Lottery Fund ‘All our Stories’ grant and aims to increase awareness of geodiversity and the local character this gives to the county of Berkshire. GeoRecord Berkshire sets out to record and explore the geodiversity of the county by training local people to recognise local and exotic stone used in buildings, seen in outcrop and contributing to the local character of the area. The project focuses on 8 communities across the county, although others can use the material provided. The county geology is chalk bedrock in the west but sands, clays and gravel in the south and east. This has given rise to different use of the land, especially for agriculture and extraction. The different soils produced by the different bedrocks have meant that some areas are more suited to arable farming whereas others have livestock. The geology is also reflected in different building styles. Churches and churchyards often display use of local stone and this can be unrecognised or hidden by later renovations. Berkshire has historically produced many bricks, especially around Reading, but the last brickworks closed in the 1960s and it is important to record use of this material where possible. The project started in November 2012 and will run through most of 2013. It involves training, exploring, recording, walks, talks and events in 8 communities across the area. Local residents will be trained to understand and recognise geodiversity features that give their local area its character. These may be in the form of landscape, quarries, soil, industry, buildings or local building materials. Four workshops across the county will be held to explain the project and to talk to individuals about their memories and local knowledge. Each session will have a presentation about the project which will include background on geology, landscape and local character, followed by an informal session to talk to individuals. The project aims to collect information about all of the different geodiverse aspects of the 8 local communities and publicise this as part of a local identity, with the help of local groups. A report summarising the results will be made available and a template produced for other communities to use.